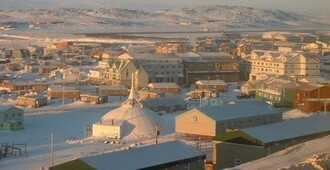 Clyde River is located on the east coast of Baffin Island and best known place for tourism. The fiords surround the area which stretches all the way into the Barnes Icecap. The rock and ice climbers come to the mountains, icebergs and glaciers in the Clyde River area from around the world. Polar bears, caribou, narwhal, seals, and other sea mammals are found in the Clyde River. The sea air is always fresh on the Clyde River and it gets more snow than many Arctic communities.